The objective of this activity is to enhance your ability to think outside the square and apply your imagination to your photography. Gestalt Psychology is the field of study that is dedicated to human perception and explores the way we, as humans, see the world around us. We construct our thoughts by our previous experiences. An example of this is when we see faces on the surfaces of Mars. Our brain looks for things it recognises, so when we see an odd shaped mountain on Mars we instantly see it as a face. Giuseppe Arcimboldo used these theories in his paintings, constructing amazing portraits made up of fruit, vegetables and all sorts of other objects. You need to construct and photograph a portrait that pays homage to Giuseppe Arcimboldo from related objects. Your selection of objects is completely up to you, only limited by your imagination, but as a group they must be related to each other. Some examples would be, nuts, bolts and screws or another group could be a collection of jelly babies, jelly beans, smarties , or buttons and reels of cotton, etc. The more you concentrate on the small details the more interesting your final image will be. For reference, have a look at Giuseppe Arcimboldo’s portraits and the intricate details he used to construct his paintings. Allow about 1 hour to complete this activity (set up and photograph), this 1 hour does not take into account your preparation work, which in this activity is vital. The more thought and work you put into the preparation the easier the exercise will be, and will also have a direct reflection on the quality of the final image. Post the portrait into your blog accompanied by a 250-word commentary on the process and reflections on the final image. Firstly, let me state that I am absolutely NOT Guiseppe Arcimboldo’s armpit.. I don’t look at an apple and see a rosy cheek, likewise a scallion doesn’t inspire me to think of eyebrows, so when I got this worksheet, I cried on the inside. Thankfully, I have a good and dear friend called yahoo search, and by sheer willpower, lots of caffeine and the ability to re arrange keywords in a search engine, I found some images that weren’t fine art. However, they were absolutely in the minority. I never would have thought that creating the human likeness out of edible matter was so popular and that such intricate detail was possible. Well, I wouldn’t be upsetting that apple cart, because I was absolutely not in their league. Images such as the following were incredible to behold, but I knew I couldn’t create something that intricate, as I would be limited to what I could carry on a motorcycle. However, a search through children’s activity ideas led to something that was much more my skill level and minimalist style. By looking up and down the dry packaged groceries aisle, I managed to locate some materials that I thought would substitute for more realistic (and yet still stylised) skin tones, be easy to transport and handle, and not leave my hands a gooey, smelly mess at the end. However, I wasn’t happy with the idea of an entire portrait made of dried goods, I felt that it was just a little lacking in texture, so I rethought some of the peripheral details, purchasing some fresh foods and some dried fruits and confectionary. I giggled along with the checkout chick when we scanned my TWO single cherries. Then came the big test, putting the idea in my head onto a hard surface. This was a LOT easier once I had sat down and thought about what foods resembled body parts, or could be styled to do so. 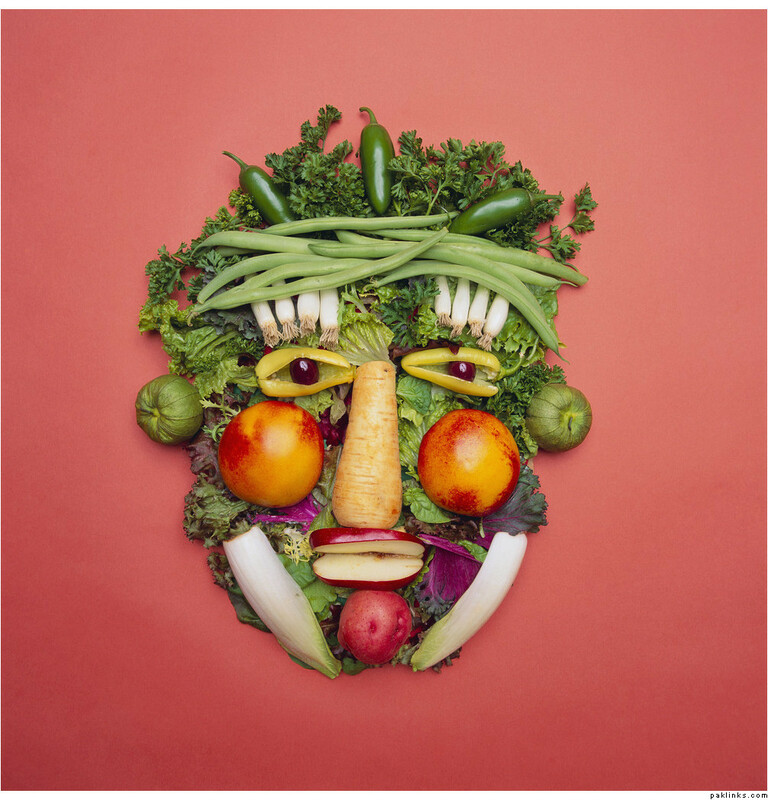 While I didn’t go for Arcimboldo’s level of depth and detail, I was pleasantly surprised at how easily the various ingredients did come together to create something that was recogniseable as a face. 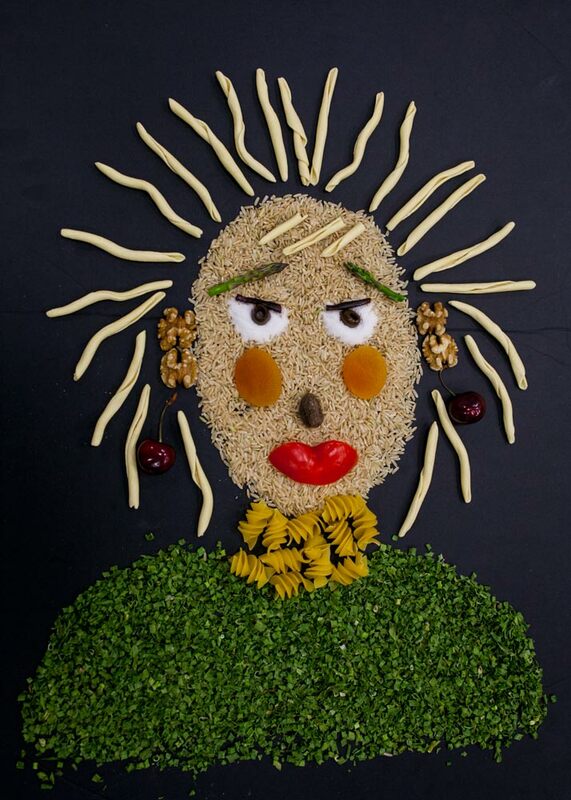 I named her Harriet, for no particular reason, her face is made of brown rice, her hair is an interesting pasta, her eyes are caster sugar, with licorice for eyeliner and sliced olives for pupils, dried chives form her shirt, walnuts her ears, apricot cheeks and her mouth is the top of a capsicum segment. After finishing, which took nearly 4o minutes, I was pleasantly surprised to realise that I really had enjoyed the creative side of bringing Harriet to life, I had purchased ingredients that I didnt’ use, put other ingredients in positions that they were not originally intended for, and along the way, I had created something unique. Thank you for the opportunity to look at things differently, not sure when I will do it again, but it will be a lot sooner than I expected when I was given this task. 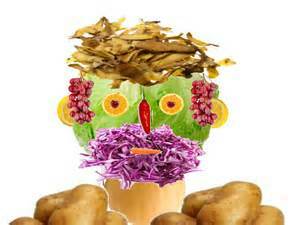 This entry was posted in Uncategorized and tagged Food, Giuseppe Arcimboldo, Portrait, Thought. Bookmark the permalink.